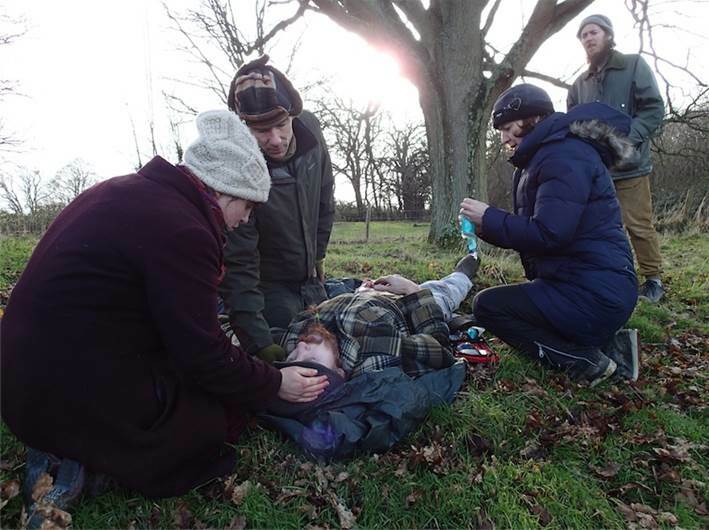 Last weekend I attended a Wilderness First Aid course with Emergency Life Support Team. 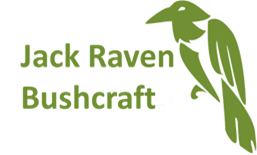 The course was run by Andy Sullivan who in the past has been in charge of first aid training for Kent Fire Brigade and worked as a Resuscitation Officer for the NHS, so someone with bags of skill and experience. As an instructor I need to take a recognised first aid qualification every 3 years, but a standard course doesn’t really fit the bill. Wilderness first aid is focused on the type of situation that could occur outdoors (so no electric shocks etc.) and also assumes that assistance will take longer to arrive. If you spend a lot of time outdoors, I’d advise that you look at this course, it’s money well spent. Andy is a great instructor and his experience is evident, when he explains and demonstrates anything it’s from first hand knowledge; he strips things back to the bare essentials and teaches simple and effective techniques. The highlight of the course for me was the scenarios, acted out by Chris in some Oscar winning performances. 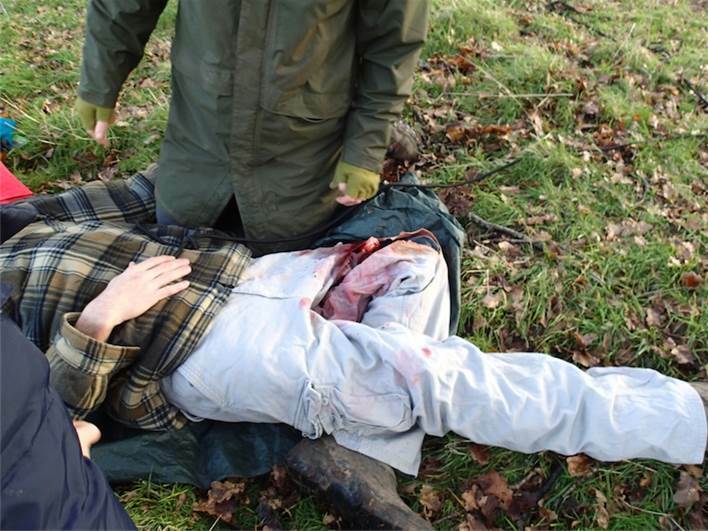 You can see some photos below of my ‘accident’, Chris had fallen out of a tree and broken his leg. In this next photo you can see a ‘broken bone’ sticking out. Chris’s acting was particularly good here! In this final photo Chris ‘passed out’ seconds before. Katy monitored the breathing while Julia and I applied a dressing to the wound. The other students on the course were fantastic company and all in all I can say that I had a great time and learnt a lot! 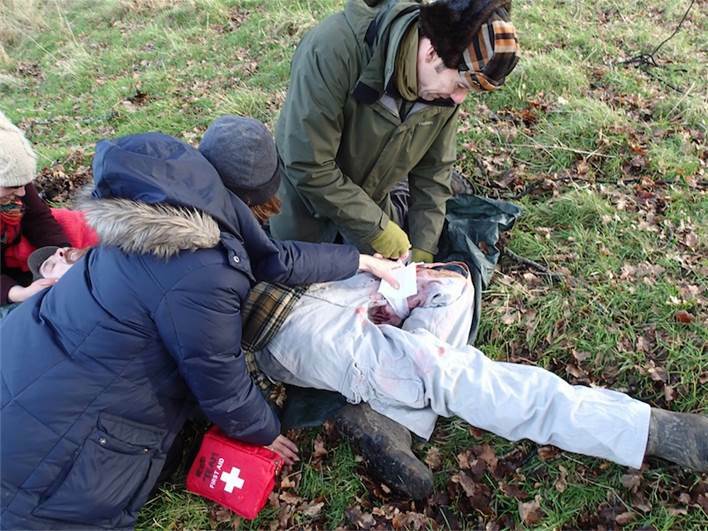 If you’re looking to get some quality first aid training, give these guys a look. Strewth!…that’s more realistic than any First Aid Course I’ve ever done.